After the couple of sessions I had focussing on losing weight, I have actually gone down a jeans size! And I’m not eating anything different, just in control of how much I eat and choosing whether or not to partake of the less healthy foods! I am really pleased with how it’s going and feel quite settled that the behaviour is actually mine and not something that’ll wear off soon. Thank you for your time and expertise! As you can see, when the subconscious is changed and boosted towards what you want, controlled eating and exercise will take care of themselves! Your subconscious is always in the driving seat, you just need to give it the right directions. People normally imagine weight loss through hypnosis to be simple direct suggestions: “yooouuu wiill beeee thiiiiinnnn!” But hypnotherapy is used to address other issues or associations, that then allow you to lose weight with ease and comfort. When you think about what your issue really is, what do you think? The issue is not that you are over the weight you would like to be. That is consequential, a reaction. The issue is not that you eat too much, or that you don’t exercise enough, as these are also consequential of something else. Your body knows how it works, subconsciously it knows how it metabolises food and how it burns off energy. You know subconsciously through experience, from eating everyday and knowing what you look like, how these processes work. So it’s not that you just accidentally do these things. The real issue is probably deeper than that. Somewhere deep inside, you may have subconsciously chosen to become overweight. This may sound crazy to you now, but it makes sense when you know exactly what will happen if you eat too much or don’t exercise enough. You didn’t overtly choose ‘I want to be overweight’ but you may have decided that the comfort of food was a greater value than looking lean. The values, fears and conditioning that ‘lock’ you into a certain lifestyle may have developed through a process not unlike hypnosis, so why not use hypnosis to lose weight? If you read more about the self-image afterwards (there is another link at the end of the page), this will make more sense. It is very relevant to using hypnosis to lose weight. There are many reasons that you may have subconsciously chosen to become overweight. They aren’t appropriate to list here being that there are as many reasons as there are people, every one is unique. With hypnosis weight loss and hypnotherapy weight loss, you can uncover the real reasons as to why you are overweight, and then work towards changing that. In case you haven’t already realised, the beauty about knowing that you subconsciously chose your self-image is that you can choose to change it to something you might prefer. Have you tried dieting? Didn’t work? The only way a diet can work is on the level of psychological change. If you work hard enough at sticking to a diet, and love the results so much you couldn’t bare to go back, you may subconsciously alter your self-image and maintain the new you (like self-hypnosis). You may do. But the odds are against it, as you are up against all of the habitual and psychological things that originally persuaded you to be overweight. In the end, what is a diet? It is a conscious effort to fight something that was created and maintained subconsciously. Dieting is like admitting that you have no real self control at all, that you are out of rapport with yourself. That’s why they can be so painful, because you are doing the opposite consciously, to what you want to do subconsciously. It’s a mental conflict! So what’s the best way? Whatever is the real cause of the issue, work with it instead of against it. Just as easily as you became overweight, you can lose it again by changing the subconscious processes. Did you think to become overweight? Then why think to have to lose it? With a hypnotherapist using a blend of hypnosis to lose weight, neuro-linguistic programming (NLP) and hypnoanalysis, you can effortlessly go inside and do some magical change work. If you change your self-image to something you would prefer, nothing will stop you achieving that. If you were tied to a table full of food you’d find a way to break free and run. It would be painful to eat too much, or to not exercise. You would find it difficult to do. Whatever it takes to get to where you want to be, your subconscious will guide you towards it. And you will enjoy it, because you are no longer in a mental conflict. Will you stop eating? Of course not. You may enjoy eating smaller portions, or less frequently. You won’t need to feel guilty about it either, because you know subconsciously that its ok to do that, and so you can enjoy it. You may not realise it now, but as you’ve been reading about hypnosis, hypnotherapy and weight loss, you will have taken things in on a different level. And tonight, you may think about who you will be, when you will lose weight and come to new realisations about what you have been doing, and what you really want. 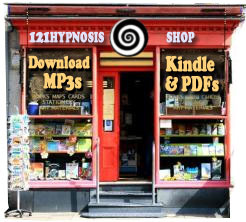 Read the Weight Loss Hypnosis program! Ok here’s the thing. I didn’t think myself fat, nor am i expecting to think myself thin. Whilst i appreciate cognitive dissonance alters my memories of why i eat too much, there exists enough clarity to identify that i cannot control it. I drink too much, when i drink i eat. I drink because i like it, it makes me feel good, (ditto food) and it dulls past pains. The result is that i am now putting on weight, and i continue to do so almost inspite of a regimented exercise commitment and an obsessive vanity. I know you will want to delve into the deepest recesses of my psyche to learn who, and why, and that may well be the next step, what i need in the first step is a control switch to stop: in fact not to stop but rather not to begin. Can you provide this? Much local research provides a selection of hypnotherapists of varying self proclaimed degrees of excellence. A girl friend visited one (who she cannot recall) and stopped smoking immediately after the first session. I have always found smoking non addictive, i can pick up and put down. I do find drinking addictive, though at this stage not addictive in an abusive way other than my ever increasing waistline and deteriorating memory. So, i identify that i drink too often and too much and that makes me fat, and also reduces my ‘resistance’ not to eat as an accompaniment. So, given that i am not rich, can i afford for you to help me? Can you help me? and… will you?